Think pink. Usually, I have a loathing of beetroot bleed-that is, when the ruby red colour bleeds into the surrounding ingredients. Here, everything gets turned a glorious shade of Schiaparelli pink. Even the salmon’s coral hue gets in on the colour theme. Brands of horseradish sauce vary greatly in strength, so taste yours first and if it is fiery you may not want to add so much. 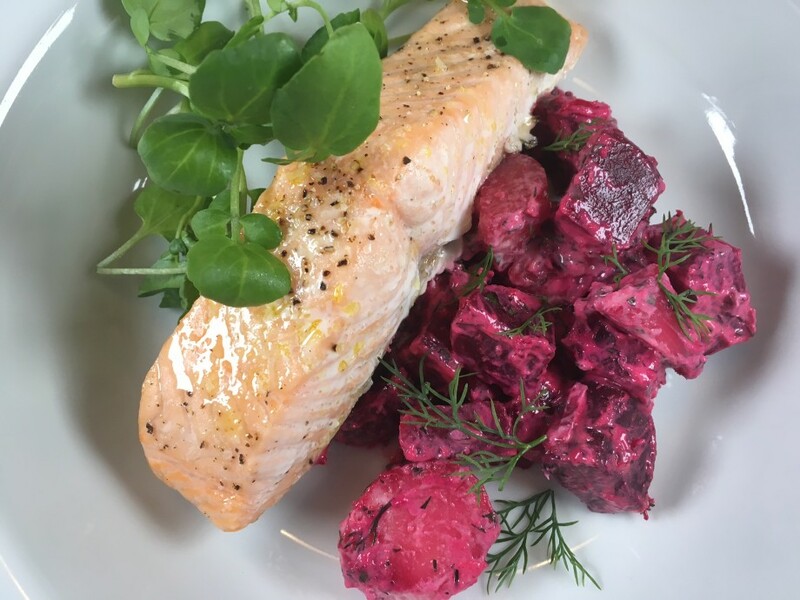 I have served the salad with warm salmon but it works wonderfully with cold salmon too. Put the chopped shallot in a small bowl and pour over the white wine vinegar. Leave to soak for one hour then drain and set aside. Put the beetroot in a saucepan and cover with cold water. Bring to the boil then turn the heat down and simmer for about 45-50 minutes. Drain and leave until they are cool. Peel off the skins and cut into bite-size pieces. Put the beetroot into a mixing bowl. Cook the new potatoes in lightly salted boiling water for about 20 minutes until cooked through. Drain, cool and peel off the skins. 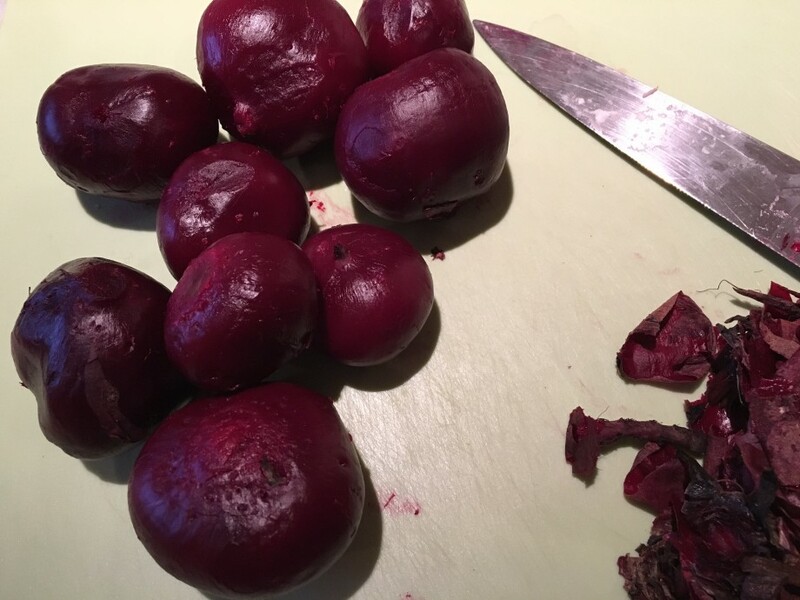 Cut into similar sized pieces as the beetroot. Add to the beetroot along with the shallot. Stir in the herbs and season well with salt and ground black pepper. In a small bowl mix the horseradish sauce with the yogurt (or cream), mayonnaise and lemon juice. 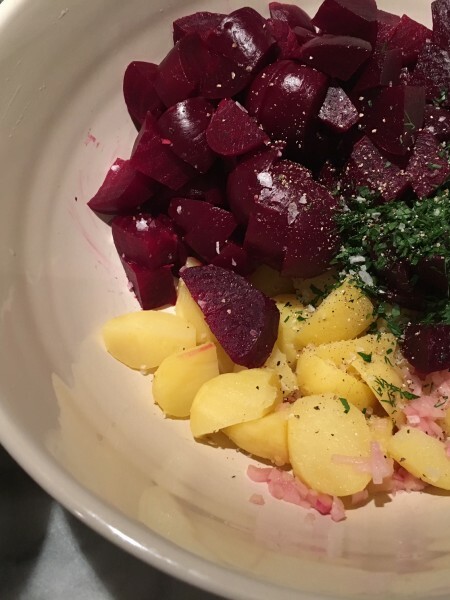 Pour over the beetroot and potatoes and stir well to coat everything with the sauce. Heat the oven to 200˚c, fan oven 180˚c , mark 6. Brush the salmon fillets with the oil and season with a little salt and ground black pepper. Cook in the oven for 8-10 minutes until just cooked through. 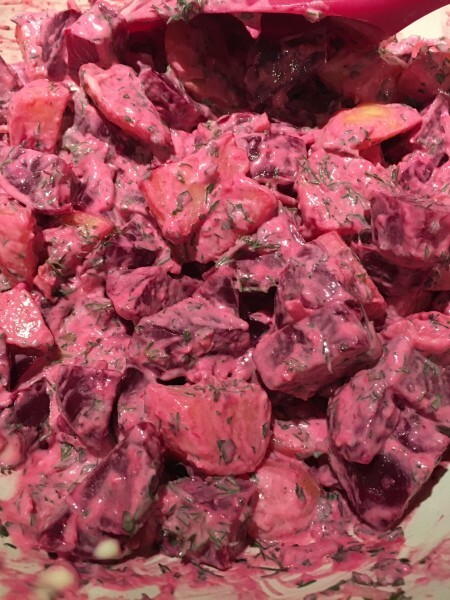 Leave for 3-4 minutes before serving with the beetroot and potato salad.